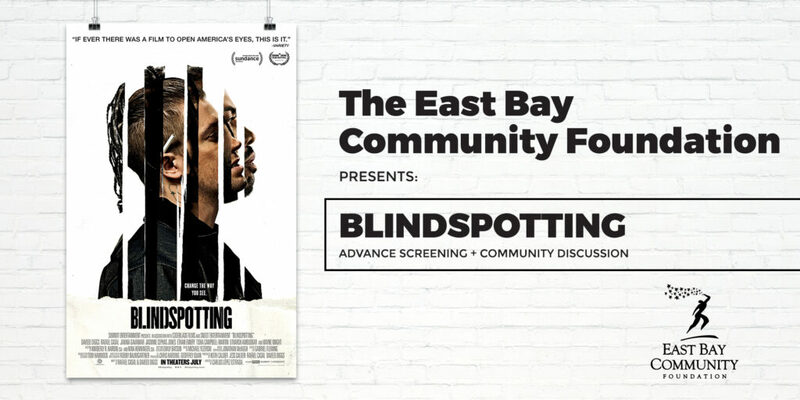 As a kick-off of our 90th year, the East Bay Community Foundation hosted an advance screening of the highly-acclaimed film Blindspotting, in theaters July 20th, starring Bay Area natives Daveed Diggs and Rafael Casal. The film’s intersecting themes of race, police violence, and gentrification in Oakland served as a thought-provoking conversation starter for our post-screening panel discussion. A big thank you to the amazing community leaders who donated their time for the event’s panel. The panel discussion allowed for reflection on how art can serve as a medium for strong narratives that either help or harm. We also had the opportunity to hear more about our panelists’ work – especially through an analysis of race, class, power, status, and the prison/military industrial complex. Finally, panelists offered steps that attendees could take to cultivate their power and use it to make a difference. Organizing a community screening and discussion on the themes raised by Blindspotting allowed us to provide a platform for deeper conversations about why our community is committed to building power, taking action, and being in constant engagement with one another. This special event was an opportunity to spark reflection and conversation, as well as invite our stakeholders and the broader community to engage with us in building a stronger and more just East Bay. Thank you to all who attended and participated. Special thank you to the Grand Lake Theater for providing the space for a moving event. If you missed it, please enjoy our gallery of photos from an amazing evening! We hope to see you at the next EBCF gathering!